An injection molding fabricator has overcome this problem by using the Cognex In-Sight® vision system, which was trained in minutes simply by taking images of the mold in the proper condition without a part. The vision system now checks the mold for the presence of the part on every cycle, eliminating the risk of damage to the mold. The mold monitoring system has also improved quality by enabling the press to run in automatic mode, which increases cycle time consistency. Injection molding machines can run in either semi-automatic or automatic mode. In the past it was necessary to run a 300-ton JSW press in semi-automatic mode because of the danger of damage to the mold if a part was not ejected. The operator had to open the safety guard door around the mold after every cycle to check that the part had been ejected into a drop chute leading to a conveyor. During a typical eight-hour shift, the operator inspected the mold approximately 640 times. Not only was there great potential for human error due to fatigue, variable inspection times caused dimensional variations in the parts. It was not uncommon for the operator to accidentally cycle the press even though the part had not been ejected from the mold, which would result in damage. It would take up to three weeks to repair the costly mold, resulting in substantial lost revenues for the company. The fabricator wanted to take human error out of the equation in order to improve quality and reduce costs. 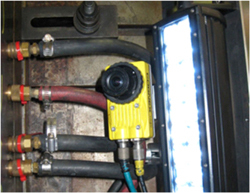 The Cognex system is very easy to program for a wide range of mold monitoring applications including insert molding, short shots, part presence or absence, runner presence or absence and before and after shot inspections. The cost of the system is less than the cost associated with damage caused by one missed part. The Cognex In-Sight vision system meets all of the requirements required by the injection molding industry. Its small size and flexible mounting capability makes it easy to fit into nearly any press application. The system is very easy to program with a library of 22 vision tools. Inspection tools capture images of the mold with the part properly ejected. These images are used to train the vision system. Then if the part remains in the mold or any other problem occurs, the vision system reliably detects the problem. The system uses the In-Sight Software Development Kit to develop a user interface for the new mold monitoring system with a simple point and click setup. The interface makes it easy for the user to configure the vision system for new applications or molding machines. The user can specify a tolerance that determines the vision system’s rejection standards. Up to 16 configurable windows can be activated or deactivated by the user. It took just 10 minutes to develop the program press. After the setup was complete, the job was saved onto the camera and PC for backup and future reference. The operator simply turns the camera on and waits for it to boot, then starts the PC to power up the mold monitoring system. The camera automatically loads the program specified by the user and puts it online. The pattern-find function is able to locate the area that needs inspection from anywhere in the field of view so the program can consistently detect the presence or absence of the part despite the fact that the two sides of the mold might be in different positions. Another important advantage: there is no need for a manual check of the mold: this has allowed the operator time for other tasks. Previously, the press operator could only handle a single machine, but now has time to handle two machines, substantially reducing labor costs. Despite handling the two machines, the operator has more time than before for inspecting the parts, which has helped to improve quality.